I feel like I’ve been away from my blog for the entirety of 2014 – I have reviews in my queue that were never posted, months where all I did were WoWs, posted some small reviews in the spring, missed BEA and missed my own five year blogoversary. Guys, it’s been a crazy year. I met my boyfriend in November of 2013, was in a classroom as a sub almost every day until June 2014 and worked a part time job. I then quit my part time job, spent five weeks in Australia and New Zealand visiting my high school best friend, received my first full year teaching job in September and moved in with the aforementioned boyfriend in October. I don’t even know what I did to deserve 2014, but I am so glad it happened to me. But friends, my reading slump and busy days are over and I owe it all to my students and the book As You Wish: Inconceivable Tales from the Making of The Princess Bride by Cary Elwes. I’ve read four books out loud to my students so far this year and re-newed my love of MG and YA, and reading As You Wish in two days helped me remember my passion for a good story. I am hereby setting a resolution: read more. Post more. Gush more. Connect more. I can do it, and I will do it. Starting tomorrow I am back to my two reviews a week, plus TTT and WoW. I am taking a break from browsing 2015 releases to type this and I am getting pumped for this year of reading. It’s looking amazing! March is going to be picture book month here at Escape Through the Pages! Life has thrown me some interesting curve balls these last few months and I’m a bit behind on my reading. So to let me catch up and start posting reviews in April, I thought I’d dedicate March to picture books. Twice a week, I’ll have up a synopsis and quick review of a picture book (and I have a ton to choose from). Some will have Teachable Moments to go with them, some won’t. Things will be starting up tomorrow! 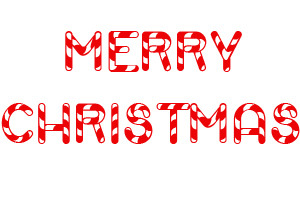 Posted in Blog Extras, Contests	by Cait H.
Merry Christmas everyone! I hope you all had an amazing day (whether you celebrate or not). I spent mine with family, playing Futurama Monopoly and crying over the end of the Doctor Who Christmas Special. As it is nearing midnight my time, I thought I’d put up one more giveaway for the Christmas season. Since this one is a physical book to mail out, I unfortunately must keep it to Canada and the United States only due to shipping. But, if you’re an international reader, go check out yesterday – a giveaway for you is there! 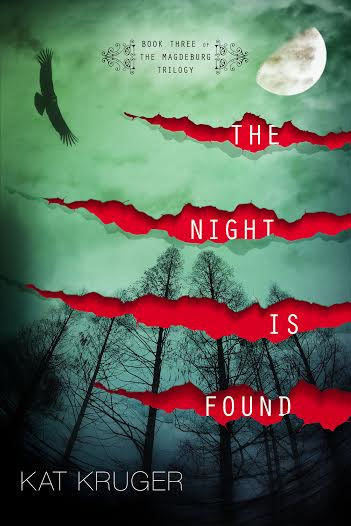 Up for grabs – ARCs of Magisterium by Jeff Hirsch, The Darkest Minds by Alexandra Bracken and The Dream Thieves by Maggie Stiefvater. Must be thirteen years or older. Open to CA/US only. Duplicates will be disqualified. Please fill out the form below to enter. Ends at 11:59pm EST on January 5, 2014. click here if you cannot see the form below. Merry Christmas Eve everyone! I know I haven’t been the best blogger lately, but I am aiming to change that come the New Years. I’m into my work groove and out of my reading slump so I have high hopes! Until then, have an international giveaway on me! And come back tomorrow for another giveaway and look for one on New Year’s Eve. Two winners will receive a book of their choice up to $10 CAD from The Book Depository! Ends January 5, 2014 at 11:59pm EST. Duplicate entries will be disqualified. Must be 13 years or older to enter. Please fill out the form below of click this link if you can’t see the form. Posted in Blog Extras, YA Fiction - fantasy/sci-fi	by Cait H.
Yep! Yep! Yep! There’s a revealing going on. 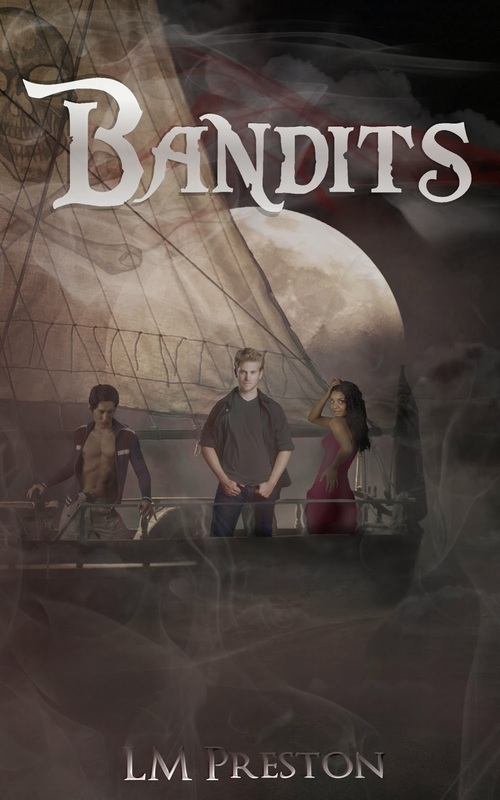 If you have an insatiable appetite for PIRATES and romance with MYSTERY thrown in, than you are in for a great ride with the BANDITS series. Book 2 in the series WASTELANDS by LM Preston comes out Spring 2014 (May). 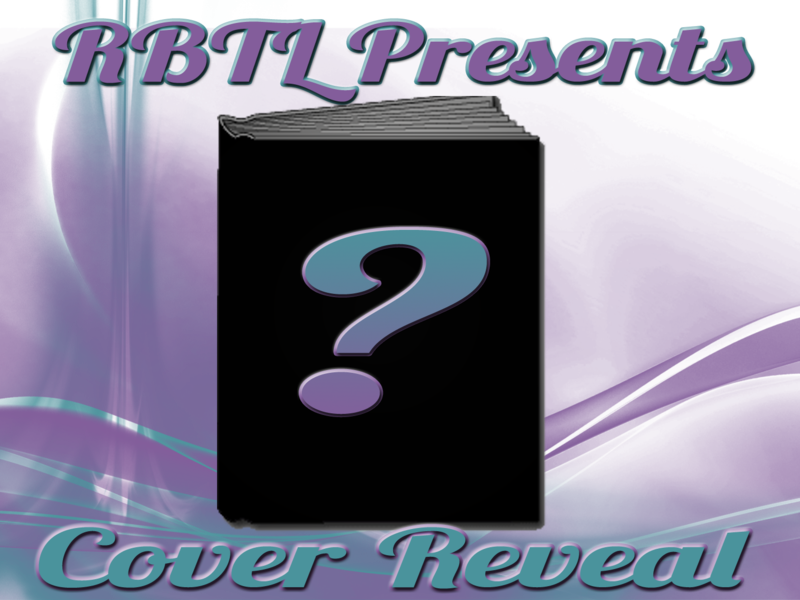 However, she couldn’t wait to share the details of her Smokin’ Hot Cover! Take a moment to add it to your GOODREADS reading list! 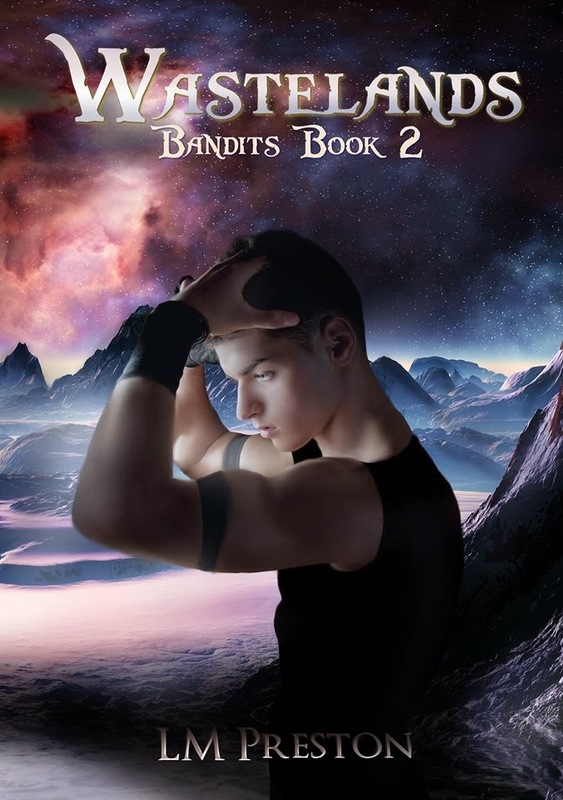 And enjoy a FREE read of the 1st book in the series, BANDITS! here. L.M. Preston was born in Washington, DC. She loved to create poetry and short-stories as a young girl. A Techie and Educator for over sixteen years, she started writing science fiction under the encouragement of her husband who was a Sci-Fi buff and her four kids. She has an obsessive desire to write and create stories of young people who overcome unbelievable odds. She loves to write while on the porch watching her kids play or when she is traveling, which is another passion that encouraged her writing. 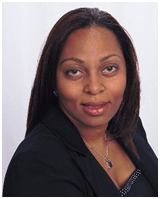 In addition to being an author, she’s also a Moderator for Yalitchat.ning.org, 2012 Vice President of Mid Atlantic Book Association and 2012 co-chair for the Maryland Writer’s Conference. A couple of weeks ago I was extremely surprised to receive an e-mail from Kobo Inc. asking if I would be interested in reviewing their newest upcoming e-reader, the Kobo Aura HD. While I don’t read a significant amount of e-books, those that I do are on my original Kobo from a few years back, so I was happy to try out their newest device – and I’m quite loving it! The Kobo Aura HD is an E Ink display touchscreen e-reader, showcasing a ridged back that fits very well in your hand (much more comfortable than holding the flat back of my original Kobo or a tablet). Very easy to set up, all you need do is plug it into your computer. If you’re a new Kobo user, you’ll need to download the Kobo desktop application. I just had to update mine and I was good to go. After everything had been all set up through the computer (and the system walks you through it, it’s very user friendly), I just unplugged it, let it update itself and then voila – a handy tour through my new e-reader! 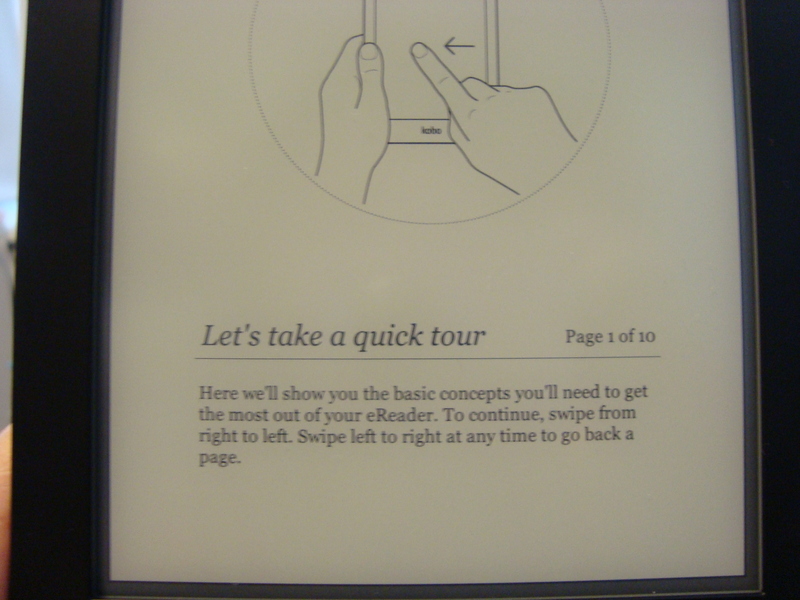 Swiping to the left and right changes pages, and the tour explained the important icons and areas to be found on the Kobo Aura HD – as well as let you know there is an optional backlight. The button is located at the top, next to the red power slider. It’s perfect for night time reading, and you can easily adjust the brightness. The home screen has a nice layout with the links for your library, bookstore, Reading Life at the bottom and a drop down menu up top by the battery icon for settings and wi-fi (did I mention yet that this newest Kobo also has wi-fi?) The home screen also tells you when your last sync to the desktop was, your current reads, recommendations, and newest books added to your library. Lots of things to explore and get used to, but it’s all laid out very well. Compared to the original Kobo which has a navigation button on the bottom and side buttons for home and menu (no touch screen), the process of using the Kobo Aura HD has been smooth and fairly quick (though it does take a good 4-5 minutes for the Kobo itself to update after each time you plug it in to your computer, update your library, charge it and such, and then unplug it again). 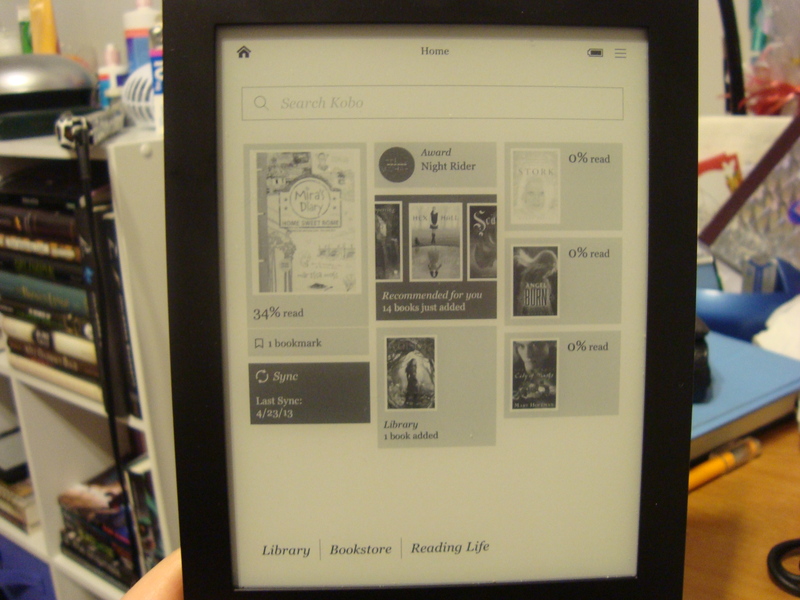 The Kobo Aura HD accepts numerous formats for e-books, text, images and comic books. 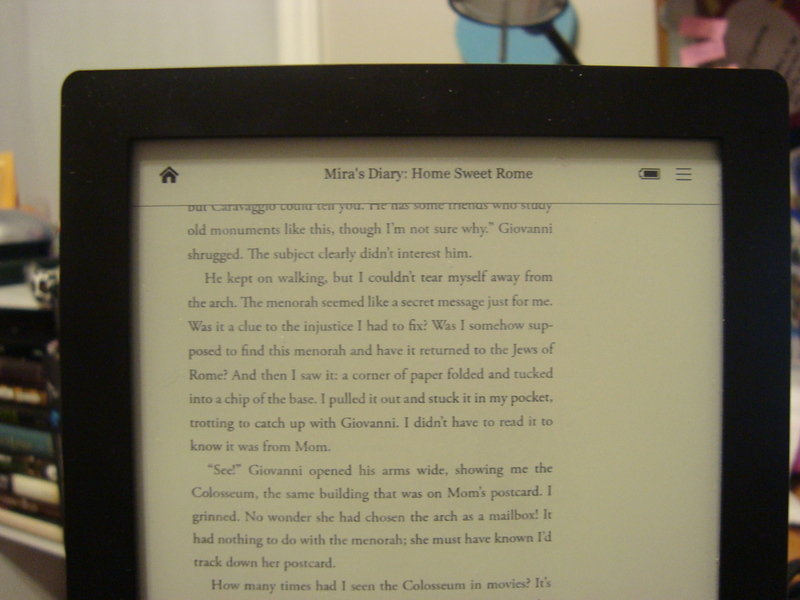 I currently have ePubs and PDFs on mine, and there is a bit of a difference in readability. The PDFs, while MUCH better reading than on the original Kobo, are still a bit slow between page flips and more difficult to customize for your best reading experience. You can zoom in if you find the font small, but cannot change the font itself (at least, not that I’ve discovered). ePubs on the other hand are amazing. Page turns are ridiculously quick and seamless and the font is a decent size to start but very easy to customize if you want something different. Tapping the very top or bottom of the page will bring up your navigation menu, settings, zoom, light brightness (if on), etc. Swiping downwards diagonally from the top right hand corner creates a bookmark, and you can tap and highlight words to access the dictionary. With space for a micro-HD card and already 4GB of memory, you can carry thousands of books with you at one time. 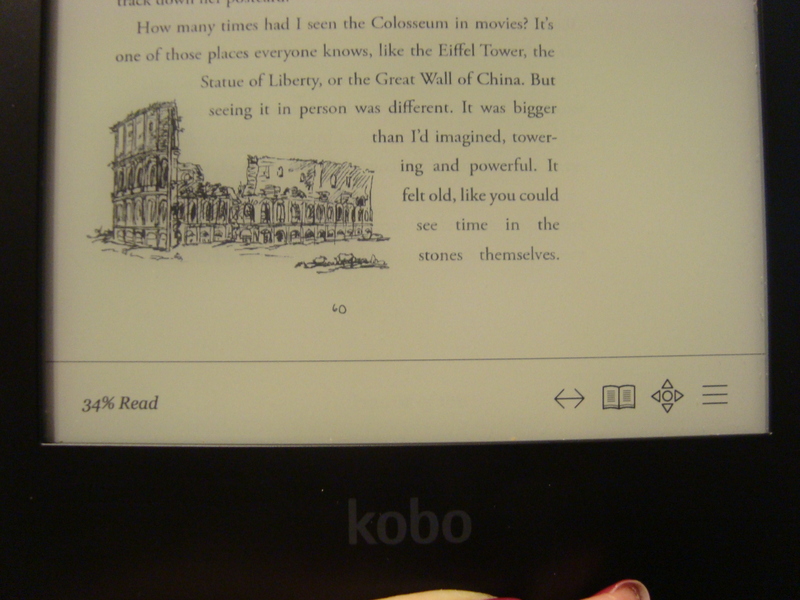 While I am always going to prefer a hard copy book to e-reading, The Kobo Aura HD (and any Kobo device, really. I quite enjoyed my original Kobo) definitely makes it easier to read those e-books that I do have and will be perfect for traveling and my purse (much lighter than a hardcover book!). If you’re in the market for either a new e-reader or are just starting out with them, I definitely recommend Kobo and the Kobo Aura HD. It’s available now from Kobo Inc. and Indigo.ca, and Kobo has a wonderful overview of all their e-readers on their website so you can find the perfect one for you. So however you decide to get your literature fix, happy reading! 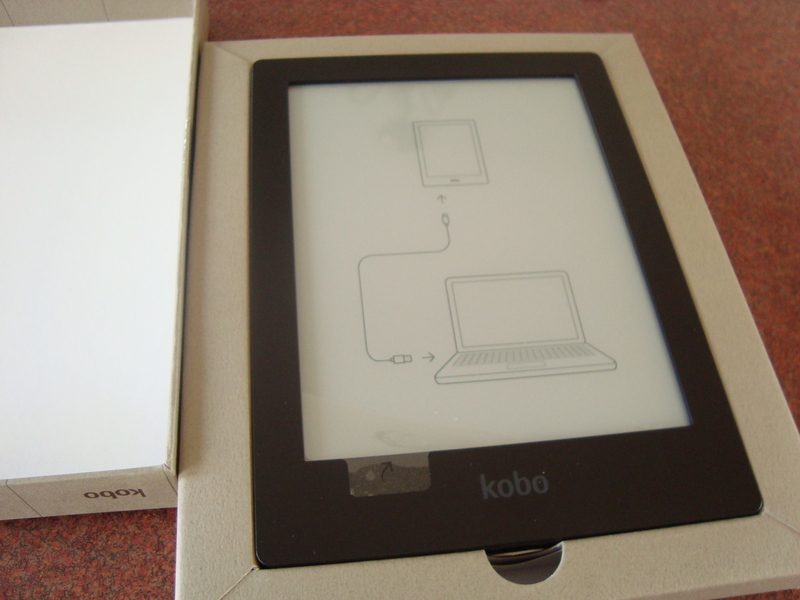 The Kobo Aura HD in the pictures was provided to me by Kobo Inc. in exchange for my honest review of the product. Thank you!